18Bet is a really fresh addition to our sportsbooks list. The company is also offering a decent welcome bonus offer if you sign up through us. Learn more about this 18Bet Betting Bonus, key terms and conditions, and full details of the offer in the following lines. In order to be eligible for our exclusive bonus, you have to register an 18Bet account using our sign-up link and use our promo code WSB100 while creating your account and depositing money for the first time. Enter the bonus code: WSB100 while making your first deposit. Minimum deposit of €10 or more applies. Minimum odds for each bet of 1.80 or greater. 12x Bonus + First Deposit turnover requirement. £20 credited as 4 x £5 free bets. Not valid with Cash Out. Free bet valid for 4 days. Claim 18Bet €100 Bonus Now! How Does the 18Bet Bonus Work? To get your welcome bonus you need to enter the bonus code WSB100 at the time of registration and when making your first deposit. As soon as you finish depositing funds into your 18Bet account you will be credited with your bonus. It is important to know that players who don’t enter the bonus code above while making their first deposit won’t be able to acquire the bonus. To play through your welcome bonus and withdraw funds you need to fulfill some turnover requirements. You need to turnover your bonus and first deposit 12x in the sportsbook. For example, if you deposit €50 into your account and receive €50 on top, that means you need to turn over €1200 in the 18Bet sportsbook prior to cashing out your funds. While your welcome bonus offer is active you will only be able to place bets at minimum odds of 1.80. Acca bets will also count towards the turnover requirements; however, each leg has to have minimum odds of 1.80 or greater. How Can I Claim My 18Bet Bonus? Please follow the steps below to claim your exclusive 150% up to €100 welcome bonus. Enter WSB100 in the “promo code” field. Deposit €100 to receive the maximum bonus. 18Bet will credit your bonus to your account. 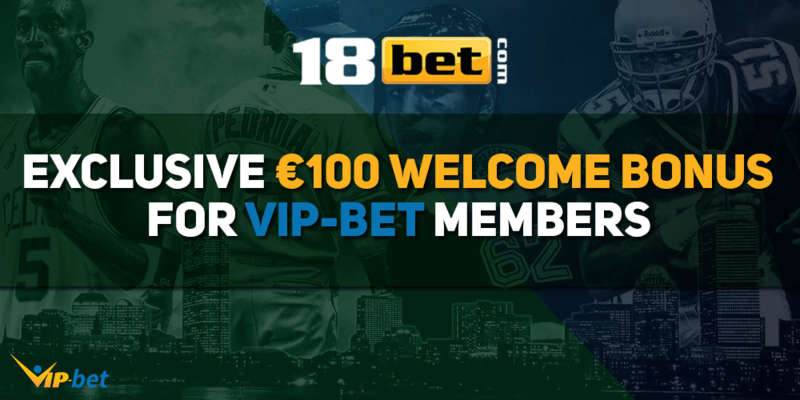 If you have signed up through our special 18Bet deal, you can also participate in our exclusive VIP-bet promotions. These are private promotions which are only available for VIP-bet members. Here are the detailed terms and conditions of the 18Bet welcome bonus offer. If you want to take a look at the full detail page, feel free to visit the 18Bet website. This promotion is available for all new customers of 18Bet for the period 24.04.2017 – 31.12.2018. 18Bet reserves the right to change the promotional period at any time. Players who fail to enter the bonus code along with their first deposit on the deposit page, cannot receive the bonus after the deposit has been successfully processed. The minimum deposit eligible for participating in this promotion is 10€/$/£ (or equivalent to EUR). The maximum bonus amount for this promotion is 100€/$/£ (or equivalent to EUR). In order to cash out the bonus and the winnings accumulated, players will need to rollover both the amount of their deposit and bonus amount 12 times. Example: A customer deposits 10€ and receives a 10€ bonus automatically. In order to withdraw the amount, they are required to meet a rollover of 240 = 12 x (10+10). The maximum bet amount to count towards the rollover requirements for this promotion is 50% of the given bonus. Example: if your given bonus is €100, the max amount to be counted towards the rollover requirements is €50. If you place a €50 bet, it will be counted as €50, but if you place a €100 bet it will be counted as €50 as well. 8. Combo bets count towards this bonus as long as the odds for each of the selections in the combo are minimum 1.80 (decimal). 9. Customers with active bonus are not allowed to place bets with odds lower than 1.80 (decimal). The system automatically restricts such bets. Void, tie (refunded) or canceled bets, will not be counted towards the rollover requirements for the bonus. For any bet placed, funds are deducted from the player’s real balance. If there is no available real balance, the wager is deducted from the bonus balance. As long as a player has an active bonus campaign, they cannot open a withdrawal request. An activated bonus will expire within 21 days of its activation. Customers must complete the rollover in 21 days or the entire bonus balance and real money winnings will be automatically voided. In cases where the customer chooses to leave the bonus campaign using the “Leave” button under “Campaigns” section, prior to meeting the roll over required, all bonus money and real money winnings will be forfeited. Customers can only have one active bonus at any time. To claim another one, the current bonus should be closed or completed first. It is 18Bet’s prerogative to occasionally review customers’ betting activity and in case a bonus manipulation has been detected, we reserve the right to cancel ineligible bets and any winnings generated from them, and/or reclaim all bonus and winnings money accumulated by a manipulative customer at any time and at our sole and absolute discretion. – Multiple bets placed on the same outcome of the same event. – Bets placed on the opposite sides with the same outcome of the same event. Registration and participation are allowed only once per person, family, household address, email address, payment account number, IP address and shared computer, i.e. Public library or workplace. Bonus will be refused to players who do not comply with this term and odd accounts will be closed. (Please, refer to General Terms and Conditions – Duplicated accounts policy) We reserve the right to withdraw the availability of any offer and to redeem all bonus and winnings money accumulated by any customer or group of customers at any time and at our sole and absolute discretion. Players from Australia, Burkina Faso, Estonia, Lithuania, Latvia, Moldova, Romania and Ukraine, cannot participate in this promotion. 18Bet reserves the right to reclaim the bonus or cancel this promotion to any customer or group of customers, according to its judicial opinion. General 18Bet Terms and Conditions apply, unless otherwise stated. These Terms & Conditions are part of the General 1xBet Terms & Conditions.